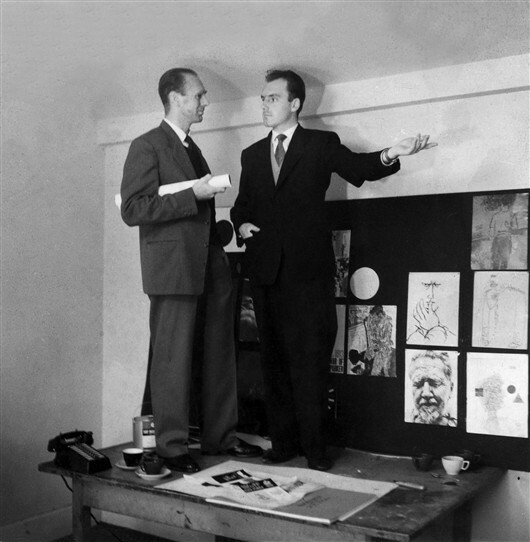 In 1960, I started work as a typographer at a London West End advertising agency. At my job interview in Mayfair, I was handed over to Senior Typographer Ted Gallon to test my suitability. Ted was a quiet, serious and unassuming man, but it still came as a surprise when he left to enter the church. I got married and lived first in South Benfleet and then commuted from Hadleigh. It was quite a surprise to get a request from the Vicar of Hullbridge to take some photographs and design a brochure for his church. My former colleague was now the Vicar at St Thomas’ church. The brochure was printed and we lost touch again. Years later, on a visit to Hockley church I found a very similar looking brochure and to my surprise I was listed in that, too, as the designer. Finding again a photograph from my early days in London started the memories flooding back. 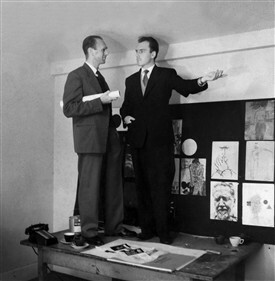 The picture has the two of us posing as architects or something as aid to an illustrator, no doubt for an advertisement. To get the angle right we had to stand on a table and we just managed without hitting the ceiling. I got in touch with St Thomas, Hullbridge, and there wasn’t a great deal of information. Ted and his wife Peta had moved from Hullbridge to the parish of Takeley near Stansted Airport. Both are believed dead now, though they were remembered as very popular among the Hullbridge congregation at the time. I tried the Chelmsford Diocesan offices for further information without success, so I contacted Holy Trinity church, Takeley, where the Gallons are still remembered by friends among the congregation. They were residents in the parish from 1975 until 1983. Rev E. Gallon took early retirement to enable him to care for his wife Peta, who was suffering from Parkinsons.They moved to Hurst Green, Surrey, where their daughter lives, though they kept in touch with friends in Takeley and the Rev Gallon visited there last in 1992, after his wife’s death. It’s just a silly little photograph, but it brought back a great deal of memories. This page was added by Robert Hallmann on 17/12/2012. If any of the scrolling banner images at the top of the page grabs your attention then just click on it to enter the banner gallery and freeze the action. If you cannot find anything of interest then why not try using the site search engine - type a word or two into the little box in the site header and then click "Go"